Persistence Market Research (PMR), in its recent study on the pressure relief valves market, offers a detailed value-volume analysis of the pressure relief valves market on the basis of various segments such as product type, set pressure, end use, and region. In terms of product type, the spring loaded pressure relief valves segment is projected to be a lucrative segment in terms of growth opportunities, and these are considered to be the most common type of pressure relief valves. There has been significant growth in various end-use verticals due to the expanding oil & gas and pharmaceutical sectors and outperforming global trade growth. From a macroeconomic point of view, a positive outlook for end-use industries will create opportunities for pressure relief valve manufacturers around the world. The pressure relief valves market report covers market analysis through basis point analysis (BPS), absolute dollar opportunity index, market attractiveness analysis, and Y-o-Y growth. The volume analysis for the pressure relief valves market has been considered in ‘000 units (number of pressure relief valves for the current base year), covering data for the historical period 2013–2017 and forecast for 2018–2028, with 2017 as the base year. This global pressure relief valves market report consists of around 19 sections that elaborate market numbers in terms of volume in ‘000 units and value in US$ at the regional and global levels. The first section of the global pressure relief valves market report covers an executive summary that highlights the key trends that are being witnessed in the global pressure relief valves market from the manufacturers’ side as well as consumers’ side. The next section covers the global pressure relief valves market introduction, including the taxonomy by product type, set pressure, and end use; definitions of the segments considered; key success factors to the market; and other information relevant to the global pressure relief valves market. In the next section of the global pressure relief valves market report, we have included market viewpoints that include macroeconomic factors, forecast factors, and value chain analysis, along with a list of raw material suppliers, and pressure relief valves manufacturers, distributors, and end users. This section also covers the market dynamics, which includes several drivers responsible for the growth of the market, restraining factors, and opportunities in the market, as well as several trends with respect to global as well as regional markets. The successive section of the global pressure relief valves market report includes a global industry analysis by volume and value, along with pricing analysis for North America, Latin America, Europe, South Asia, East Asia, Oceania, and the Middle East & Africa, with a weighted average price for every region and product type segment. The next section of the global pressure relief valves market report includes a qualitative and quantitative analysis of the pressure relief valves market by every segment considered. The report also includes an additional section with detailed analysis of the market for three emerging countries - China, India, and Argentina. This pressure relief valves market report focuses on analysing the market opportunities and getting a detailed understanding of the pressure relief valves market. The report elaborates on the regional analysis, market dynamics, market intensity, market structure, and competition landscape of the pressure relief valves market for the next ten years, i.e. 2018-2028. Each section of the pressure relief valves market report includes a qualitative and quantitative assessment of the market on the basis of historical data or developments, and facts and key opinions collected from various end-use industry participants through primary interviews, annual reports, newsletters, press releases, etc. 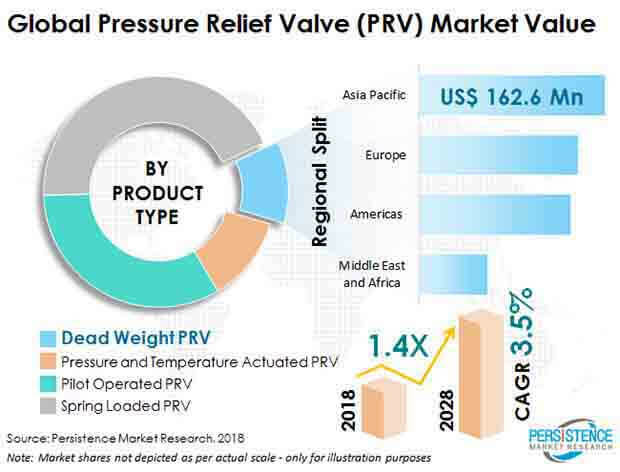 The report on the global pressure relief valves market studies some of the major players in the pressure relief valves market, such as General Electric, Emerson Electric Co., Watts Water Technologies, Inc., Weir Group Plc., Alfa Laval Corporate AB, Curtiss-Wright Corp., Flow Safe, Inc., CIRCOR International, Inc., AGF Manufacturing, Inc., Mercury Manufacturing Company, IMI Plc., and Goetze KG Armaturen, among others. The initial stage of the research study includes the formulation of assumptions, which are necessary for primary and secondary research. Further stages of research involved the triangulation of the data collected from these two approaches. To analyse the global market trends and opportunities for pressure relief valves manufacturers, the market has been segmented on the basis of product type, set pressure, end-use industry, and region. For the analysis of consumption, we have considered FY 2017 as the base year. Basic data was collected from manufacturers’ annual reports, newsletters, public reports published by governments, valve manufacturing organisations, private agencies, World Bank’s sources, etc. For the final analysis of the market data, we considered demand-side as well as supply-side drivers and trends in various regional markets. We have forecasted the market data on the basis of key developments, regional trends, and the production-consumption scenario of the pressure relief valves market. For forecasting the market data, we have considered historic data for the period of 2013-2017. The global pressure relief valve market was valued at around US$ 4.2 Bn in 2017, and is estimated to grow at a 3.5% CAGR over 2018–2028. In terms of unit sales, East Asia and South Asia are expected to register relatively high value and volume growth in the pressure relief valve market throughout the forecast period. Healthy growth of industries such as oil & gas, chemical processing, power generation, pharmaceuticals, pulp & paper, and food & beverages, among others, in China, India, and other Asian countries, is the key driving factor for the growth of the pressure relief valve market. Moreover, low production cost and labor cost, and lenient regulations in such regions are encouraging various end-use vertical players, including oil & gas, pharmaceutical, chemical, and textile manufacturers to expand their manufacturing facilities in these regions, which, in turn, is expected to drive the demand for pressure relief valves. With the growing number of accidental incidences (overpressure) in several industries, there has been a greater demand for enhanced safety in any industrial operation. Regulatory bodies have formed numerous regulations to improve operation safety, and thus, there has been greater demand for high-performance pressure relief valves. With around 50 reactors under construction, nuclear power capacity is steadily increasing all across the globe. Pressure relief valves play an important role in the successful and safe operations of nuclear plants by protecting turbines, super heaters, and boilers to help the stations run at predefined pressures. Growth in digitalization and the increasing need for remote applications have enhanced the demand for smart pressure relief valves that help in improving their durability and minimizing product loss. India, Argentina, and the ASEAN region are picking up in the pressure relief valve market, owing to the robust outlook of various industries in these countries. The governments of various countries are launching healthcare schemes and programs to improve healthcare facilities. Such policies and initiatives are expected to translate into positive changes across the value chain of the healthcare industry. For instance, in 2018, the Government of India initiated a National Health Protection Scheme, 'Ayushman Bharat'. Under this scheme, over 100 million poor families in the country will get a cover of around US$ 7,000 per family per year. Thus, the aforementioned factors will increase the demand for pharmaceutical drugs, which, in turn, will boost the demand for pressure relief valves in the pharmaceutical industry during the forecast period. The setting up of chemical plants meant for the manufacturing of crude oil by-products across Latin America is expected to boost the manufacturing sector in Argentina, Brazil, Peru, etc. The installation of manufacturing plants is expected to create scope for the installation of high-pressure pipelines, and subsequently pressure relief valves for the transmission of chemicals, steam, etc. In the recent past, Honeywell International Inc. announced the installation of a new PET plant worth US$ 0.9 billion in Brazil, and there will be one more investment worth US$ 8.1 Bn towards the fertilizer sector, i.e. urea, ammonia, and phosphates. Moreover, investments are planned for expansion in Argentina (new LAB plant), Peru (ethylene and polyethylene plant), Mexico (ethyl benzene plant), etc. The chemical Industry in the United States is one of the most prominent manufacturing destinations. The country caters to both, the domestic as well as global markets. The chemical industry generally includes specialty chemicals, basic chemicals, etc., and requires a huge number of pressure relief valves. Expansion in the chemical industry will fuel the growth of the pressure relief valve market across the U.S. as well as the world. Top companies operating in the pressure relief valve market include are General Electric, Emerson Electric Co., Watts Water Technologies, Inc., Weir Group Plc., Alfa Laval Corporate AB, Curtiss-Wright Corp., Flow Safe, Inc., CIRCOR International, Inc., AGF Manufacturing, Inc., Mercury Manufacturing Company, IMI Plc., and Goetze KG Armaturen, among others. These players are trying to expand and grow in the pressure relief valve market through strategic steps of development. This report on the pressure relief valve market is designed to provide relevant information regarding these players, and also about the key strategies that they have adopted.